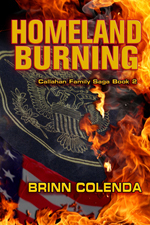 Brinn Colenda is a graduate of the United States Air Force Academy and a retired lieutenant colonel. He served in a variety of flying and staff assignments around the world from Southeast Asia to Bolivia. He was an instructor pilot with the U.S. Air Force, the German Air Force, the Dutch Air Force, Great Britain’s Royal Air Force and was awarded command pilot wings by the Bolivian Air Force. He has published articles in professional journals and his local newspaper. His first political-military thriller novel, Cochabamba Conspiracy, won awards from the Military Writers Society of America and SouthWest Writers. His second thriller, Chita Quest, explores MIA/POW issues as well as military families under stress. It won awards from the Florida Authors and Publishers Association, Military Writers Society of America, and first-place from the New Mexico-Arizona Book Cooperative. He has advanced degrees in economics and business, and had a post graduate fellowship at the Hoover Institution for War, Revolution and Peace at Stanford University. 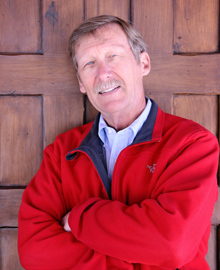 Brinn served on the Angel Fire Village Council for almost six years. He and his wife, Linda, now divide their time between Angel Fire and Boquete, Panama. Spring of 2000: Wildfires destroy mountain watersheds and municipal water systems, breached dams release tidal waves of water to obliterate farms and towns, and stone-cold shooters target helpless civilians as USAF Colonel Tom Callahan struggles to convince a skeptical U.S. intelligence community that enemy attacks on American soil are not only possible, but inevitable. Callahan suspects that Kurt Wallerein, the world’s foremost terrorist-for-hire, feared, hated and hunted by every intelligence service in the West, has unleashed a terrifying campaign against the American Heartland to undermine the legitimacy of the United States government. Callahan has to rally support to stop the attacks, but his political enemies in Washington conspire to distract the President and ridicule evidence, forcing Tom to go rogue. He’ll need all the help he can get from aviators of the New Mexico National Guard, the Civil Air Patrol, and the Ninety-Nines. 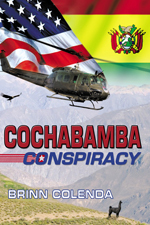 Cochabamba Conspiracy won third place in the 2009 SouthWest Writers Annual Writing Competition in the suspense/adventure/thriller category and a silver medal from the Military Writers Society of America in the suspense/mystery category. Award winning author Brinn Colenda captures the essence of international terrorism as Kurt Wallerein, feared, hated and hunted by every intelligence service and law enforcement agency in the West forms a partnership with an embattled Fidel Castro. Their goal is to destabilize the democratic governments in South America—and the United States. Lieutenant Colonel Tom Callahan, USAF and his compadres in the US Military Group-Bolivia risk their lives and reputations battling enemies foreign—and domestic—in this exciting novel. Were American POWs left behind at the end of the Vietnam War–either by accident or design? Colonel Tom Callahan is driven to find out–his own father is still listed as Missing In Action. What Callahan doesn’t understand is how politically explosive the issue is, domestically and internationally. As he begins his quest, friends and associates meet violent deaths. Aided by his Australian-born wife, Colleen, his journey takes him halfway across the world to Vietnam, China, Mongolia, and ultimately, Siberia. He is helped and hindered by unexpected friends and cunning, deadly enemies. 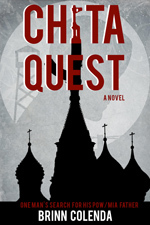 Chita Quest won the 2014 New Mexico-Arizona Book Award gold medal for Fiction-Adventure, double silver medals in 2014 from the Florida Authors and Publishers Association in suspense/thriller and cover design categories, and a silver medal from the Military Writers Society of America in 2016.